A Labour MP accused of lying about who was driving her speeding car will face a retrial after a jury failed to reach a verdict. Fiona Onasanya, 35, is alleged to have claimed a Russian man was behind the wheel to escape prosecution for driving 41mph in a 30mph zone in July 2017. The MP for Peterborough had denied a single charge of perverting the course of justice, at the Old Bailey. Her brother has previously admitted three counts of the same charge. The prosecution had claimed Ms Onasanya and her brother Festus Onasanya, 33, “acted jointly in telling lies” to claim she was not driving her Nissan Micra when it was clocked by a speed camera in Thorney, near Peterborough at 22:03 BST on 24 July last year. The court was told a Notice of Intended Prosecution (Nip) was returned and named Aleks Antipow – the previous tenant of a property that Ms Onasanya and her brother had rented in Cambridge – as the driver, jurors heard. 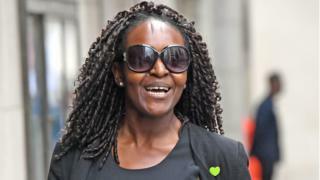 Ms Onasanya told the court that she did not know who was behind the wheel at the time of the offence. When a notice of intended prosecution arrived in the post, she said she “assumed” she was not driving that Monday because of her Westminster commitments, even though Parliament was in recess. She left the letter at her mother’s house for whoever had been driving her car to deal with, not realising it was her responsibility as keeper of the vehicle, she said. The sentencing of Mr Onasanya, of Chesterton, Cambridge, had been adjourned until after her trial.